The search found 73 results in 0.094 seconds. This budget explainer describes what Medicaid is, how it is financed, and who benefits from it. 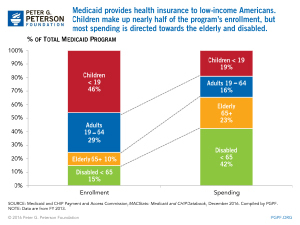 Medicaid provides health insurance to low-income Americans. Children make up nearly half of the program’s enrollment, but most spending is directed towards the elderly and disabled. Projections of federal healthcare spending have improved but are still climbing as a share of the economy. Medical spending increases rapidly with age. An aging population and rising per-enrollee healthcare costs will drive sharp increases in Medicare spending, which will not keep pace with the program’s funding sources. U.S. health care spending is highly focused on the costliest patients. One in four medicare dollars is spent on people who are in the last year of life. The Peterson Foundation has prepared analysis based on those reports, illustrating the key data points with pertinent chart information. The Trustees urge lawmakers to enact legislation soon to put Medicare on a sustainable path. A new organization established by the Peter G. Peterson Foundation, announced three major initiatives to advance the Center’s mission to transform U.S. healthcare into a high-performance system that delivers high-quality care at a lower cost.